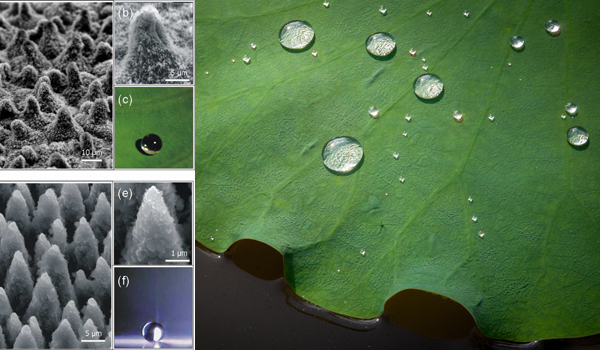 One of the few plants that can claim to be superhydrophobic is the lotus. With its bumpy structure and waxy self-regenerating material, its surface will always stay dirt-free, something the lotus needs in the harsh and muddy habitat it lives in. This very high water repellence property is obviously replicated in man-made materials, such as self-cleaning coatings (ex: Lotusan paint), roofing tiles, technical fabrics and so on. You can get a closer look (real close) at the leaf here.